ABUJA - Trial of the leader of the Indigenous People of Biafra, IPOB, Nnamdi Kanu and four others, yesterday, took another dimension as his whereabouts posed a difficult puzzle for a Federal High Court, sitting in Abuja, to unravel. 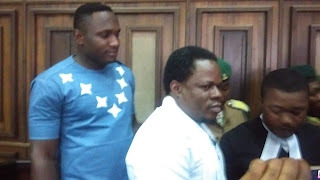 Following Kanu’s absence in court, the Prosecution counsel, Mr. Shuaibu Mogaji Labaran, moved a motion for the revocation of his bail which was opposed by Kanu’s defense counsel, Barrister Ifeanyi Ejiofor. Justice Nyako: Ejiofor, you know I don’t like grammar. What Mr. Labaran has just said is that the first defendant is not here and for the simple reason that he’s not here, that I should revoke his bail. Now it is my turn to ask you, where’s your client because I don’t like grammar? Barr. Ejiofor: My Lord, the first defendant was on the 25th of April, granted bail by this Honourable Court and the matter was consequently adjourned to the 11th and 12th day of July, 2017 for hearing. This date My Lord, unfortunately, fell into the annual vacation period of the Court and before then, we’re served with a hearing notice adjourning the matter to 17th of October for hearing. My Lord, on the 4th day of September 2017, l led a team of other lawyers representing the first defendant on a pretrial Conference against the hearing of today. Labaran: My Lord, I hope he’s not moving his counter-affidavit in response to our motion? Justice Nyako: Am not interested in that, am only interested in knowing why the first defendant is not here. Barr. Ejiofor: My Lord, on the 14th day of September 2017, the first defendant’s home was invaded in the comfort of his bedroom. Justice Nyako: How did you know about that? Were you in his bedroom? Barr. Ejiofor: My Lord, I spoke with him. Justice Nyako: Say what you know, please. Barr. Ejiofor: My Lord, am sure about that, I know it very well. It is on our oath, Sir. Justice Nyako: When we get to that oath. Barr. Ejiofor: As court pleases. Justice Nyako: What I want to know is, where’s the first defendant, why is he not in court today? Justice Nyako: Listen, I want you to talk to me about what is the problem. Barr. Ejiofor: My Lord, what am saying is before you, Sir. Justice Nyako: Where’s it? I have not seen it. Barr. Ejiofor: The suit is before you, Sir. Justice Nyako: You filed a suit, what suit is that? I don’t have it. Not this suit? Is it a suit I have mentioned? Justice Nyako: Then I don’t know about it until it has been mentioned in court. Justice Nyako: So, what you’re telling me is that you really don’t know where your client is? Barr. Ejiofor: Yes, I don’t know. What am saying My Lord, is that the soldiers that went to his house should be in a better position to tell My Lord where my client is today. Justice Nyako: No, am asking you. Barr. Ejiofor: I don’t know Sir. Justice Nyako: You must talk. Where’s he? Justice Nyako: That is it, you don't know where your client is? Barr. Ejiofor: In addition to that My Lord, they’re fully aware that my client’s matter is coming up today Sir, they’re fully aware. Justice Nyako: You do not know where your client is? Barr. Ejiofor: I don’t know Sir but what am saying is that the soldiers that went to his house should be held responsible since that day, we have not heard about him. Justice Nyako: Where’s your evidence? Barr. Ejiofor: My Lord, we’ve even filed a suit before you, Sir. Justice Nyako: Mr. Ejiofor, I said I did not know of a suit that I have not been taken up this morning. That is your problem because you filed it. It is not before me. Barr. Ejiofor: My Lord has given a date for the hearing of the suit. Justice Nyako: It is still not before me. Do you know it is not my job? Do you know your case? I don’t know about it until you report to Court and until I’ve taken cognizance of the case, I do not know about it. Okay, so, you don’t know where your client is? Barr. Ejiofor: Very well Sir. Justice Nyako: Where are the sureties? If you don’t know where your client is, it means the sureties will come and tell us or they also do not know where he is? At this juncture, a lawyer representing one of the sureties, Senator Enyinnaya Abaribe(Abia South, PDP), Ogechi Ogbonna, Esq., said, “My Lord, speaking from the Bar, my client informed me that he doesn’t have information on the whereabouts of the first defendant since the military operations in Abia state and he has even filed an application pending before My Lord to be discharged. In her response, Justice Nyako stated that Sen. Abaribe must produce the first defendant in court and then ask for his severance or withdrawal of the suretyship otherwise, he risks the forfeiture of his bail bond. According to her; “It can only be discharged if he has produced him(Kanu) in court, that can be done only of the defendant is standing here. “Irrespective of what the situation on the ground is, he(Abaribe) remains the surety until the defendant appears in court and until he produces him, he cannot escape from the suretyship, otherwise, he forfeits his surety bond. Is he ready to do that? “Whatever motion you’ve filed still boils down to what I have asked you. It’s either he forfeits the surety until the defendant is here and he says 'I have produced him, I now want to watch my hands off him, let him look for another surety', which means his bail is no longer perfected, which means he is going back to the prison custody until he perfects the bail surety. That is scenario 1. The surety’s lawyer opted for option 3 to fetch and produce the first defendant(Nnamdi Kanu) in court during the next adjourned date. Lawyer representing the third defendant, Benjamin Madubugwu, Barrister Inalegwu Adoga prayed the court to grant request directing the Prisons authority to allow his client access to a hospital including a plea to dismiss his charges and also to separate his client’s trial from the rest of the defendants, citing he has stayed up to two years in detention. According to Adoga, “After his brief, I filed an application which should be looked at My Lord, especially on the application that he has to go to a hospital. That the Deputy Comptroller of Prisons services should order that he be taken to a hospital. “My Lord, we have also other four applications in court which among them, is to quash the charges. We also filed an application for a separate trial. They have spent two years already, in prison. However, in her reaction, the presiding judge asked, “What is wrong with him(Madubugwu), where is the medical report? There’s a clinic in the Prison. If the prison’s clinic is not capable of handling his ailment, then you write a report. I don’t want to take applications without evidence. “On the application to quash the remaining five-count charges, I have taken that before. I’m not quashing any charge and you see, you’re wasting my time. Listen, this goes to all of you as well, any application(s) you think you’re going to file that is going to stall this trial, I’m going to take it out and rule on it at the end of this trial, so you are not going to waste my time. “So, coming to your application, I’ve gone through all those charges as it affects these three defendants. Those five-count charges remain because I’ve read through those charges carefully and I did not see anything as to why I would quash it. I’ve even taken my glass prescriptions but am not going to say anything on it. 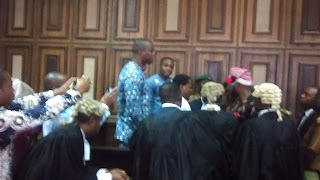 Lawyer to the fourth defendant, David Nwawuisi, Barrister Maxwell Okpara, also asked the court to give orders directing the Prisons authority to allow his client have access to his private medical doctor, adding that he (Nwawuisi) had lost confidence on the capability and his safety in the hands of the Prisons medical experts. Like the third defendant, he also demanded the severance of his client’s trial from Kanu’s. He said, “My Lord, we have two motions before you for hearing. The first one is seeking the order of this Honourable Court directing the authority of Kuje prison to allow the fourth defendant has his own private medical doctor who also happens to be working in a government establishment, to have access to his medical record and health on the ground that he has lost the confidence on the medical team in Kuje prison based on their utterances. “The doctor has made several attempts but they said they can only do that on court order. It is only a tree that will hear they want to kill him and it stands, if you tell a human being that you’re going to kill him, he will run. So, the motion is ripe for hearing being filed on the 4th day of July 2017, which ought to have been taken before vacation. “My Lord, we also made another application that my client is ready to face his trial and the problem created by the complainant and the first defendant, cannot affect my client. So, if My Lord can separate my client, so that he faces his trial and also apply to the Attorney General or alternatively, My Lord, we have a pending motion for bail. Reacting to his prayers, the judge charged the Prison warders to take into consideration, the wellbeing of their prisoners adding that the Prisons are part of the judiciary. According to the judge, “I hope the Prison warders in this court are listening to me? The Prisons is an agency of the court not for agencies of government. Anybody who comes to prison is there because a court has ordered that the person stays there, either as awaiting trial or he has been convicted. So if you understand your role well, you’re actually an extended arm of the judiciary. So threatening the life of the 4th defendant is just bluffing. Okpara also complained bitterly in court on the unfortunate attitude of the Prison attendants who according to him, always compel him to disclose certain private information(s) whenever he comes to visit his client in Kuje Prisons. According to him, they usually ask him silly questions such as “Where am I living, how many children do I have, they almost asked me how I sleep with my wife. Other lawyers that are representing their clients in criminal charges do go to prison to see their clients but anytime I go to see mine, they begin to ask me questions. Okpara also brought to the attention of the court concerning a pending application for his client’s bail, saying that the Prosecution is yet to file any counter-affidavit against the application. “My Lord, this application was frustrated this morning. The first defendant and Complainant frustrated it at the detriment of my client, as for me, am ready to go on,” says Barrister Maxwell Okpara. “Exactly, you see this is the problem, some defendants are frustrating this case against the other defendants because if the first defendant is here, I would know what to do but in a criminal charge, we cannot conduct the trial in the absence of one of the defendants unless I have his death certificate. As far as am concerned, he (Kanu) is on bail and he’s not in the court,” Justice Nyako replied. Justice Binta: Mr. Ejiofor sit down. Have I called up this case? Am I dealing with the case now? Even if it is coming up after this case, it is not still before me. I don’t know what your problem is. If you don’t want me to handle this case, I'll remove myself. I send you back to square one to start somewhere else. Justice Nyako: No! You’re frustrating me. You’re getting on me, you’re getting on my nerves. You’re trying my patience. The case is not before me, I’ve told you that before, sit down. You’ve sued the Chief of Army Staff, Is he here? Have I called up the case? Is the case slated for hearing today? Then what’s your problem? Don’t bring your clarifications to my attention, am not interested. When the case comes up bring whatever application you want for hearing. What if I refuse to preside on that case? Please let us do the right thing. You’re the one bringing student lawyers to court and you’re teaching them bad things. Sometimes, I think you need to see the red side of my eyes. I think I’ve been bringing white glasses, I’ll be bringing coloured glasses. I have heard all you have said and am going to take them serially. 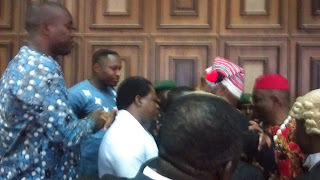 The defense lawyer to the fifth defendant, Bright Chimezie Ishinwa, Barrister Chukwudi Igwe, announced appearance for his client who was recently drafted to join the rest of the defendants in the suit. The lawyer complained bitterly that he has not been able to see his client who was on a two-count charge of illegal importation of firearms and conspiracy to commit treasonable felony. He, however, asked the court to compel the Department of State Security Services, DSS, to produce his client in court for him to fully face his trial even after being acquitted and discharged by a Federal High Court in Akwa Ibom. He stated, “Your Lordship, it is important that I should give court this information. I said I was standing for the fifth defendant. My Lord, we were filed weeks an amended information which tends to bring in my client as a defendant in this suit. “The first defendant is still absent. Am going to make an order, the surety should come and tell me why he’s not in court. Am not taking a decision of his bail absence because I want him to remember that the bail bond says you’re to produce him in court on every day his case is adjourned for trial. You see, when you take somebody on bail, he has become your world. You also monitor that he doesn’t breach his bail conditions, that is part of what you signed. “People just append their signature to bail conditions without actually knowing what they mean. They also give you a responsibility to ensure he does not breach his bail conditions. “His (Kanu) not been present in court today, is a breach of his bail conditions but am not going to take a decision because I need his sureties to come and show me why he’s not in court. Her judgment goes as follows: “The first defendant is not in court, the sureties should come and show why he is not in court and why I should not issue a bench warrant against him. “The second surety, Senator Abaribe, will plead for the refuse for the excuse of the bail of his suretyship when the first defendant is produced or if he decides to forfeit his bail bond. “The Prisons authorities are hereby directed to allow the medical doctor of the fourth defendant have access to his prison records and for his treatments following laid down prison procedures and also extend same to the third defendant. Detailed reporting. Well done Biafra Times reporters and Biafra Family writers. As Barrister Azubuike Anoliefo wrote, the FG led by Buhari and army chief - Burutai have frustrated the case and are contempt of the court. They invaded the defendant home without court order. They should produce Kanu and bring him to court -- dead or alive. Judge Binta Nyako must dismiss the case. The sureties have no case here... The FG led by Buhari is a lawless and corrupt one.